I've never been more excited about a post than this one... it features two of my favorite fashion pieces: floral and maxi! I've had plenty of maxi dresses but there is nothing that I love more than this one from Oasap. I was not looking for a maxi dress while I was doing my usual rounds of window shopping online and then saw this dress. I did not waste another second and added this to my cart right away. In my honest opinion, Oasap is one of my trusted shops online. Their prices are unbeatable (most items range from $15-$30) and I've never been disappointed with a single purchase thus far. The perfect compliment to the dress is the turquoise statement earrings from Happiness Boutique. This is one of my favorite shades of blue and the pair quickly caught my attention when I saw this on their website. This is just one of many gorgeous earrings and statement accessories from Happiness Boutique. You can also take advantage of their Reward Program wherein you can get reward points for shopping and uploading photos of the items you purchased on the website. What is your favorite purchase lately? Blogging block. I just coined this term or read it somewhere. I'm not really sure. However, it is the blogging world's counterpart to writer's block. And it is something that I know too well. Do you have those days wherein you sit in front of your computer or laptop and you wanted to write but nothing, absolutely nothing, is coming out? You're just staring at a blank space. You doodle some words but nothing makes sense. Hence, you end up deleting everything you've written. In the world of fashion blogging wherein regular update and posts is of the essential, this can be doubly frustrating. And it's not for the lack of trying. There are some days wherein you simply feel uninspired to write anything... and yet the deadline is closely ticking on you. You have to produce something! 1. Seasonal posts. If you are literally out of ideas to write, think of the season and its prevailing trends. Then, write a post around a generic topic or zero in on a specific topic that you love about a season. For example, during specific holidays, you can create a gift guide or tips for shopping, etc. It might seem like a common post idea but we all love to hear your insight on these topics, so don't be scared to jump in! 2. Do your research. What are the things that people are talking about on social media or search engines? This is also a good way to optimize your blog content - write about things that people want to read or know about! 3. Read! Like I've said before, the best way to generate new ideas and be inspired to write is to read, read, and read! I read at least 10 blogs a day (on a really busy day!) to get some new inspiration or to promote my blog. You'll never know where the next source of inspiration will come from. 4. Take a break. Do not beat yourself up in an effort to produce new content. If the inspiration won't come to you, take a short break. This will refresh your mind and give it a re-boot, so to speak. It is better to take a break rather than force yourself into producing low quality content. Have you encountered blogging block before? How do you produce fresh ideas all the time? Are you plus sized? If you are, chances are that you find it difficult to shop or find stores that sell clothes in your size. I am happy to report that TBDress is going to change the way you shop. 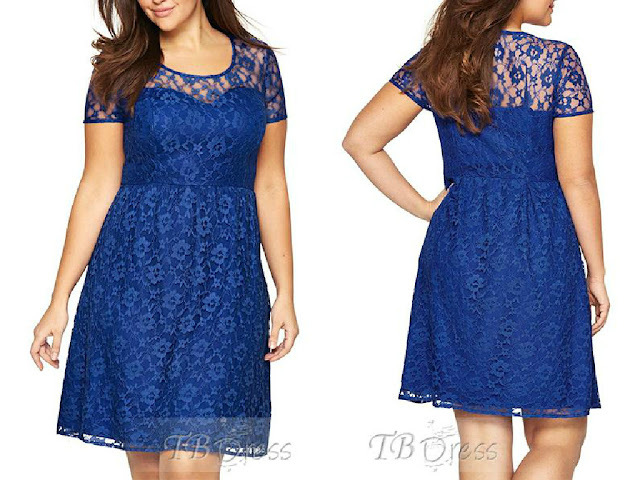 I've been partners with this company for a long time and plus sized women will have plenty of options available with their cheap plus size clothing line here: http://www.tbdress.com/Cheap-Plus-Size-Clothing-103893/. Are you plus sized? What are your tips for shopping for your body shape and size? Red is one of my favorite colors to wear as of late (as evidenced by my post here, here and here). I'm not exactly sure why or if it has any link to my love for red lipsticks; however, I like the bold statement that the color evokes. It definitely calls attention to itself. It can turn heads without the flashing print - just bold outfits that make the color shine and stand out. I finally arrived at an epiphany: it speaks a lot about my ideal style. Simple, subtle but slightly provocative. I purchased this dress from Sheinside and while it is not normally up my alley (hello deep neckline! ), I went ahead and gave it a shot anyways! That high slit... I've been dreaming of wearing a dress with such attention-grabbing slit. I am glad I can finally channel my inner Angelina Jolie with this dress. And while I was gushing about this dress, I was slightly let down by the short inner lining. But there is nothing that a trip to the tailor can't fix. And did I tell you this is up for grabs at less than $20? Yes - grab yours now! It's a surefire summer staple! Do you like dresses with slits, too?